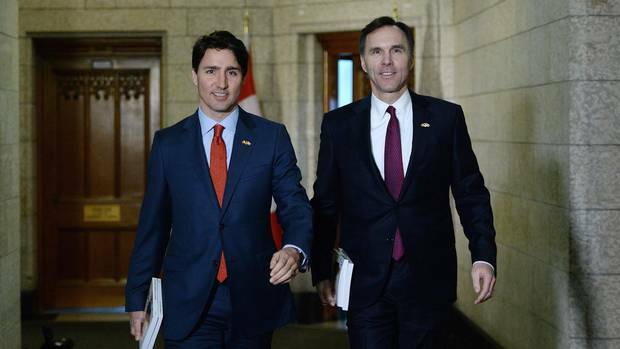 Is tax fairness on the agenda in next Trudeau budget? Will a low profile review of federal tax expenditures lay the groundwork for tax fairness in the Spring federal budget? Last Spring, federal Finance Minister Bill Morneau announced that his Liberal government would be undertaking a comprehensive review of tax “expenditures” found in the federal tax code. According to Morneau, the aims of the review are to simplify the system and make it more progressive. In the process, he hopes to find $3 billion in savings. A panel of “external experts” was appointed “to ensure that the review is informed by a range of perspectives”. While little known to the general public, the review is of enormous importance. Every year, Ottawa spends about $110 billion on programs such as health transfers to the provinces, the Canada Pension Plan, Employment Insurance, and other line item programs that comprise the federal budget. These expenditures, as with all direct spending, are put before Parliament for examination. Through this “Estimates” process, information on the costs and impact of these programs is available to the public. Far less visible and transparent is the roughly $100 billion the federal government forgoes annually in so-called “tax expenditures”. These exemptions, deductions, credits, rebates and surtaxes are not subjected to the same kinds of parliamentary accountability mechanisms that are applied to more direct government spending. Moreover, many of these expenditures (including all exemptions and deductions), while legally embodied in the federal tax code, have huge implications for the fiscal situation of the provinces in that they also define the tax “base” against which all personal and corporate income taxes are levied at the provincial level. Given the sheer scale of these tax expenditures, there is a strong argument for subjecting this hidden tax spending to the same oversight and public debate as any other spending. This is especially true given just how regressive (i.e. favouring the affluent) many of these expenditures are. If the government wants to provide billions of dollars in tax breaks to the richest Canadians, it should have an obligation to justify these gifts to the vast majority of Canadians who don’t benefit from such largesse. The last comprehensive evaluation of the federal tax system was the Carter Commission of 1966. It’s clearly time to take a top to bottom look at our tax system to see if it is the truly progressive system the public deserves. Exactly who benefits from these tax expenditures? While the true magnitude of federal tax expenditures remains somewhat murky, what we do know is cause for concern. For example, a recent report from the Canadian Centre for Policy Alternatives (CCPA) shows that, while some of these measures benefit the general population, many others benefit most those who need help the least. In fact, of the 64 tax breaks on which solid data are available, all but five provide more benefit to the top half of earners than to the bottom. In particular, the three most regressive loopholes (the stock option deduction, the dividend gross-up, and the partial inclusion of capital gains), give enormous breaks to the very rich without doing much for the majority. According to the Department of Finance, these expenditures alone cost a combined $12 billion annually – more than enough to pay for, say, a national pharmacare program. Here’s a brief look at the “Big 3” regressive tax expenditures that overwhelmingly benefit rich Canadians. The stock option deduction is an offshoot of the 50% capital gains inclusion rate (see below) and cost the federal treasury $840 million in 2016. It is for employees who, as part of their compensation, are given the option to buy company stock at a set price (e.g., today’s price). If the stock rises in the future, an employee can still buy the stock at their set price, but sell it at the going price and generate a capital gain equal to the difference between the two prices. As with capital gains, only 50% of the price differ­ence from a stock option transaction of this sort is taxable, and there is no threshold above which the government taxes 100% of the capital gain. Another regressive tax expenditure is the dividend gross-up and tax credit. With an annual cost to government of $4.64 billion in 2016, it is also one of the most expensive. This tax expenditure is extremely concen­trated, with 91% of the benefit going to income earners in the richest decile. But, again, the decile analysis actually understates the concentration. A paper by Brian Murphy, Mike Veall, and Michael Wolfson estimate half of all benefits actually go to the top 1%. Corpor­ations pay corporate income tax on their profits, which can be paid out as a dividend to shareholders. A third extremely regressive tax expenditure is the partial inclusion of cap­ital gains which cost the government $6.68 billion in 2016. The tax expenditure for partial inclusion of capital gains applies to an in­dividual who buys a stock or other asset at one price and subsequently sells it for more, realizing a “capital gain” in the amount of the difference between the two prices. It is only the capital gain, and not the entire sale price, that is eligible for taxation. And thanks to this tax expenditure, only 50% of the value of that capital gain is considered taxable income. With 92% of the benefits going to the top 10% — and very little for anyone earn­ing less than $84,000 — the concentration of benefits related to the partial inclusion of capital gains is similar to that for the dividend gross-up. However, additional analysis by Murphy et al. shows the concentration of this tax expenditure is much worse than a decile analysis suggests. In fact, the very richest 1% of tax filers reap 87% of the benefits. Is there the political will to scale back capital gains related tax expenditures? There is also a question as to whether the Trudeau government has the political will to really crack down on the most regressive expenditures given that there are powerful employer and financial interests supporting them. For example, upon being installed as finance minister, Finance Minister Bill Morneau declared tax fairness his top priority. Yet his record on the issue is mixed. He at first vowed to close the loophole on executive stock options (a Liberal Platform item), perhaps the most objectionable such tax break, but then changed his mind under heavy industry pressure. The challenge for Morneau is that the government has also promised to make Canada more innovative and attractive to investors. Some supporters of an innovation agenda argue that capital gains taxes hurt innovation by limiting the amount of money in the economy that is free to be re-invested in new projects. There are also numerous voices warning federal Liberals to rein in any proposed tax-the-rich agenda in light of plans by the Trump Administration and the Republican controlled Congress to dramatically reduce personal and business taxes. On the other hand, policy experts who are concerned with income inequality see tightening up investment-related tax expenditures as a key target given that it is primarily higher-income Canadians who have the means to generate significant additional revenue from investments. Do we really need regressive tax expenditures to spur innovation and growth? The argument that tax related investment incentives are required to spur innovation and growth has many doubters – and not just amongst those concerned with inequality. These “pro-growth” critics of the exemptions argue that it is strategic government leadership and public investments that are most critical to building innovative economies. These critics also argue that what is needed it to build on the work being done by publicly funded bodies such as the National Research Council. In support of this view, the influential UK economist Mariana Mazzucato has shown that publicly funded research as well as direct support for strategic corporate investments through agencies like Defense Advanced Research Projects Agency (DARPA), have been central to the growth of innovative capacity in the United States. Corporate research and development and venture capital often follow in the wake of ground-breaking public sector entrepreneurship. Mazzucato’s book, The Entrepreneurial State: Debunking Public vs. Private Sector Myths, cites impressive evidence in support of this thesis. For example, the parts of the smart phone that make it smart—GPS, touch screens, the Internet—were advanced by the U. S. Defense Department. Tesla’s battery technologies and solar panels came out of a grant from the U.S. Department of Energy. Google’s search engine algorithm was boosted by a National Science Foundation innovation. Many innovative new drugs have come out of the U.S.’s National Institute for Health (NIH) research. Many innovation experts agree that there is plenty of room to expand direct public investments to compensate for any scaling back of private capital gains incentives. These experts suggest that strategic long-term public investments need to be made across a much broader range of sectors than is currently the case, including renewable energy and other clean technologies. This could be done at arm’s length through existing agencies such as Sustainable Development Technology Canada (SDTC), the Business Development Bank of Canada (BDC) and the Export Development Corporation (EDC) which have the required technical and financial expertise and are not subject to direct political pressure, or through a new public investment bank. Where does pension fund investment fit in? The $12 billion being spent through the “Big 3” investment-related tax expenditures should also be looked at in the context of both the federal and Ontario governments’ intent to eliminate the 30% cap on pension plan ownership. In June, the federal government launched a consultation on whether it should scrap the “30-per-cent rule,” which currently restricts the percentage of voting shares federally regulated pension plans are permitted to hold in a company. The objective of removing the 30% cap would be to stimulate investment in industry and infrastructure and allow Canada’s pension funds to take a more “active” approach to their portfolios. In March, Ontario also announced it intends to eliminate the 30-per-cent rule on ownership of voting shares by provincially regulated pension plans. Neither the Ontario nor the federal draft regulations propose a replacement cap (say, 49% of voting shares), but rather would allow pension plans to own up to 100% of voting shares of a given corporate entity. Given that assets under management at the Canadian Pension Plan Investment Board alone is expected to reach more than half a trillion dollars by 2030, removal of the 30% ownership cap should result in a significant increase in capital available to be invested in strategic Canadian assets. This is another factor in support of the argument that it is time to scale back Canada’s capital gains related tax expenditures. What are the options for real tax reform? It goes without saying that there are many options on a continuum somewhere between getting rid of the Big 3 exemptions entirely (an extremely unlikely scenario regardless of which party forms the government) and maintaining a status quo in which the rich get almost all the benefits. For the purposes of looking at pragmatic changes that could be introduced in the Spring federal budget, let’s set aside the dividend gross-up and tax credit for the moment and focus on practical measures that could scale back the stock option and partial capital gains exemption. With regard to the stock option deduction, the Department of Finance estimates that 8,000 high-income Canadians deduct an average of $400,000 from their taxable incomes via stock options. This accounts for 75% of the deduction’s fiscal impact, which was $840-million in 2016. Most of these 8,000 high-income earners have stock options built into their compensation packages and take advantage of these stock option provisions on a re-occurring basis. Needless to say, only a minority of those who exercise stock options in this manner are employed by a start-up – the ostensible reason for allowing stock options in the first place. There are a number of approaches to stock option deductions that would let the federal government reduce the extreme regressiveness of the deduction, while not penalizing Canada’s startup community. One approach would be for the federal government to provide a one-time only $750,000 exemption on stock options. This would treat stock options in the same way as one-time capital gains for shares held in a Canadian-controlled private corporation (CCPC) for at least two years. The $750,000 exemption gives stock option holders significant financial benefits and, at the same time, eliminates a policy that allows well-compensated executives (such as those at Canada’s large banks and insurance companies) to exercise options on a regular basis without any limits. For startups, a $750,000 exemption is attractive because it is large enough to use as a recruitment tool in a market where there is intense competition for talent. Moreover, the new, more restrictive stock option rules could be forward-looking meaning that stock options issued prior to the effective date of the new rules could operate under the old rules. There is also plenty of room to gradually phase in an increased capital gains inclusion rate. Such a phased-in increase would be entirely consistent with the history of the exemption. From 1972 to 1988, Canadians had to pay tax on 50 per cent of their capital gains. The inclusion rate was increased to 66 2/3 per cent in 1988, rose to 75 per cent in 1990, before dropping back down to 66 2/3 per cent on Feb. 28, 2000 and then further reduced on Oct. 18, 2000 to 50 per cent, where it has remained to this day. In other words, a five-year phase-in of an increase in the inclusion rate to 75% (i.e. a 5%/yr. increase) would be just another “up” phase in the ongoing ups and downs in the inclusion rate since the introduction of a capital gains tax in 1972. Certainly no reason for investors to panic! And keep in mind that, under these proposals, some capital gains would remain entirely tax-free, such as the gain on the principal residence or the gain where appreciated publicly-traded securities are donated to a registered charity. In the coming budget, the federal government has a historic opportunity to undertake truly progressive tax reform that will finally bring a measure of fairness to Canada’s convoluted tax code. If done properly, the tax expenditure review currently being undertaken will present strong evidence that in the name of fairness, the extraordinarily regressive capital gains related tax expenditures can be scaled back somewhat and that public and pension fund investment can make a growing contribution to Canada’s growth and innovation performance. The opportunity is there – but will the Trudeau government seize the moment? Changing Workplaces: the coming mega-battle over Ontario's workplace rules.